PayPal Holdings Inc (PYPL.O) shares jumped as much as 11 percent in their highly anticipated return to the Nasdaq after more than a decade in eBay Inc’s (EBAY.O) fold, valuing the digital payment processor at about $52 billion. CALIFORNIA – PayPal is a giant in the market it helped create – it processed 4 billion payments tootling about $235 billion in 2014. But the online payments landscape has changed drastically since the company was snapped up by eBay in 2002. Freed from eBay, PayPal is now expected to partner with other e-commerce sites and try to seize market share from startups such as Stripe and Square and Apple Inc (AAPL.O), which unveiled its own mobile payments service last year. For eBay, the separation allows the company to focus on its struggling e-commerce marketplace. PayPal shares soared to $42.55 in early trading. EBay’s stock fell as much as 4.7 percent, valuing the company at about $32 billion. “PayPal is the gorilla among independent digital payment service providers with more than 160 million active accounts, global scale and brand recognition,” J.P. Morgan analysts said. PayPal is also looking to compete with Western Union Co (WU.N) and other money transfer companies. CEO Dan Shulman said he was looking to use PayPal’s size to offer affordable financial services widely. “It’s clear that the potential for mobile technology to transform money extends beyond commerce. The vast majority of the world’s 7 billion people lack access to even basic financial services,” Schulman told Reuters. PayPal was founded in the late 1990s by venture capitalist Peter Thiel, Tesla Motors Inc (TSLA.O) CEO Elon Musk and others. It went public in 2002 and was acquired by eBay soon after for $1.5 billion. Bowing to pressure from activist investor Carl Icahn, eBay said last year it would split PayPal as this would give both companies more focus and flexibility. The companies, however, are not severing ties altogether -eBay has agreed it won’t cut the volume of transactions it channels through PayPal for the next five years. Wall Street analysts were overwhelmingly bullish on the stock. Nine of the 11 starting coverage on the stock have a “buy” or similar rating. Only Evercore has a “sell”. Price targets range from $36 to $48. 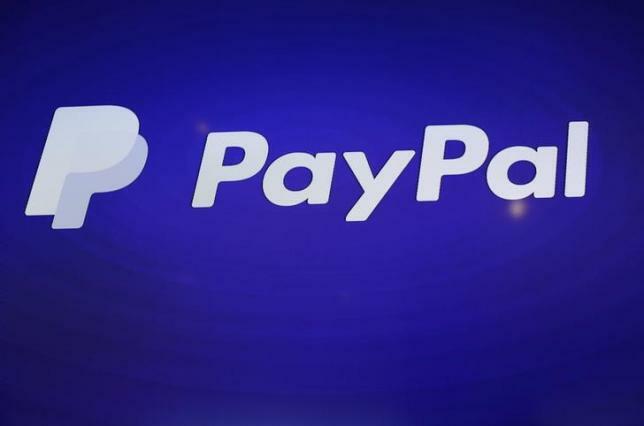 BMO capital Markets analysts said they expected investors to value PayPal relative to Visa Inc (V.N) and MasterCard Inc (MA.N), but added that PayPal had a relatively low EBITDA margin profile of 27 percent – around half that of the credit card giants. PayPal also faces a fight in the rapidly evolving mobile payments market. “The competitive advantages PayPal enjoyed in the traditional online commerce channel do not necessarily carry over into the mobile and offline worlds, in our view,” J.P. Morgan analysts said. PayPal recently acquired Xoom, putting it in a position to take on Western Union and MoneyGram’s (MGI.O) online businesses.